Speeding south-west on a stage which serves as a portal from one mountain hell to another. In holiday haven Cap d’Agde the riders face a tantalising vision of what they are missing in life: lolly-licking (yum! ), lobster-tanned holidaymakers (yikes!) and a famous nudie beach (yowza!). Keep your eyes on the road, professional cyclists. Pancake-flat until it goes exposed in the final thirty kilometres on a ribbon of road between the Etang du Thau, a salt-walter lake, and the Mediterranean. Unwary contenders, beware of crosswinds splits, which is exactly what happened just down the road into La Grande Motte in 2009. There’s also an odd third category climb, the steep but short Mont St Clair, with 20 kilometres to go. It’s Bastille Day. Expect fervent Frenchmen in the breakaway, alongside TV shots of tricolore flags a-flutter and wizened country gentlemen playing accordions. Then Mark Cavendish will win. Take that, Frenchies! Pleasant Languedoc plains replaced by Mediterranean sea. Does that beach count as scenery? Local seafood platter. We ordered this once, and some of the dish was still moving. Sorry, digestive system. If there’s a big gust, watching the crosswind chaos is a big must. “What I remember most was that it was a very fast stage with a good wind that was generally behind us. It was one of the fastest ever stages I think, nearly 49 kilometres per hour. It ended with a bunch sprint, which we knew it would and I was setting myself up for it all day. – Cap d’Agde has hosted the Tour on two occasions. In 1998, Tom Steels won a bunch sprint here. In 2009, the stage to Perpignan started here. 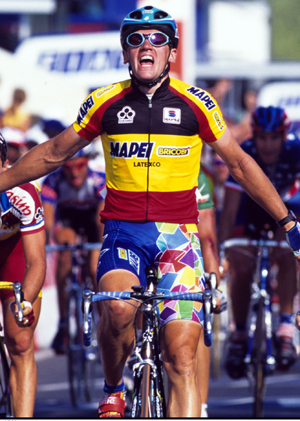 It was won by Thomas Voeckler, who held off the bunch to win by just a few seconds. 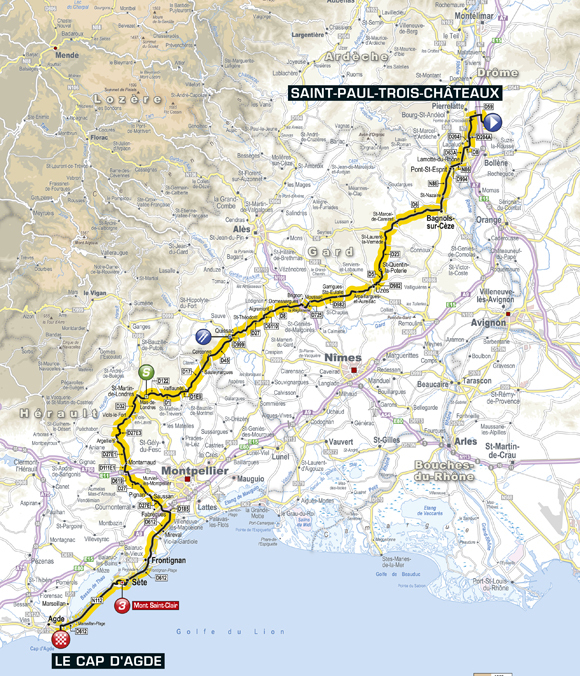 – St Paul Trois Châteaux has been used once before as a stage start, last year, on the stage to Gap won by Thor Hushovd. – This is the first flat road stage since Metz on stage six. That’s the longest stretch of non-flat road stages since 2002 – following the Béziers stage that year, there were four mountain stages, a hilly stage, then the final time trial, before the final stage to Paris.